Breslau-Gandau airfield (Polish: Port lotniczy Gądów Mały, German: Flugplatz Breslau-Gandau, also known as Fliegerhorst Breslau-Gandau, Flugplatz (Klein-)Gandau, Flugplatz Breslau and port lotniczy Wrocław) was an airfield 300 kilometers southwest of Warsaw. It was located in Wroclaw, in what was then known as Breslau in what then German Niederschlesien (Lower Silesia). The airfield was built in 1910 with the construction of a hangar for the Parseval PL-5 airship. Because of the Treaty of Versailles it became a civilian airfield from 1920. By 1932 the airfield had become a primary commercial airfield. A station building, air traffic control tower and a restaurant were opened in 1937. The airfield was shared with the Junkers aviation company which used in as an industrial airfield for the production of Ju-87 'Stukas'. 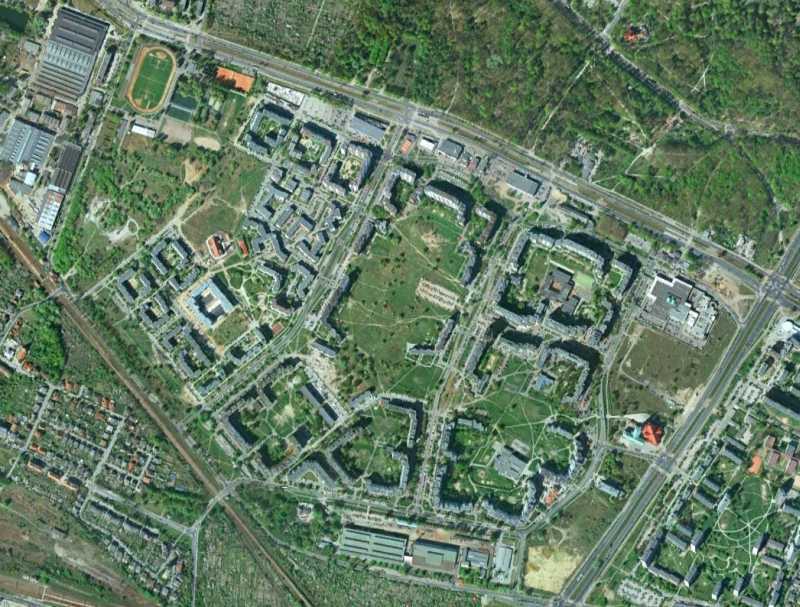 It got a Luftwaffe airfield administrative command (Fliegerhorstkommandantur A Breslau-Gandau) that grew in size over the course of the war. Flugzeugführerschule A/B 71 was formed at the airfield in April 1938 from Fliegerübungsstelle Breslau-Gandau. A year later the school became Schule/FAR71, which was the school attached to the Fliegerausbildungsregiment 71 (71 Pilot Training Regiment). After World War II had begun with the invasion of Poland the Schule/FAR71 was absorbed in FFS E (A/B) in Finsterwalde. During the invasion of Poland the airfield supported the battle with 53 Ju 52 transports of IV./KG z.b.V.2 (IV./Attack Group for special purposes 2). For most of World War II, the fighting did not affect Breslau. The number of aerial attacks was so low that Germans used to call the city the 'Reichsluftschutzkeller' (the 'Reich's air raid shelter'). Junkers continued to produce aircraft parts, especially engines, at its factory at the airfield, using slave labour from all over Europe. 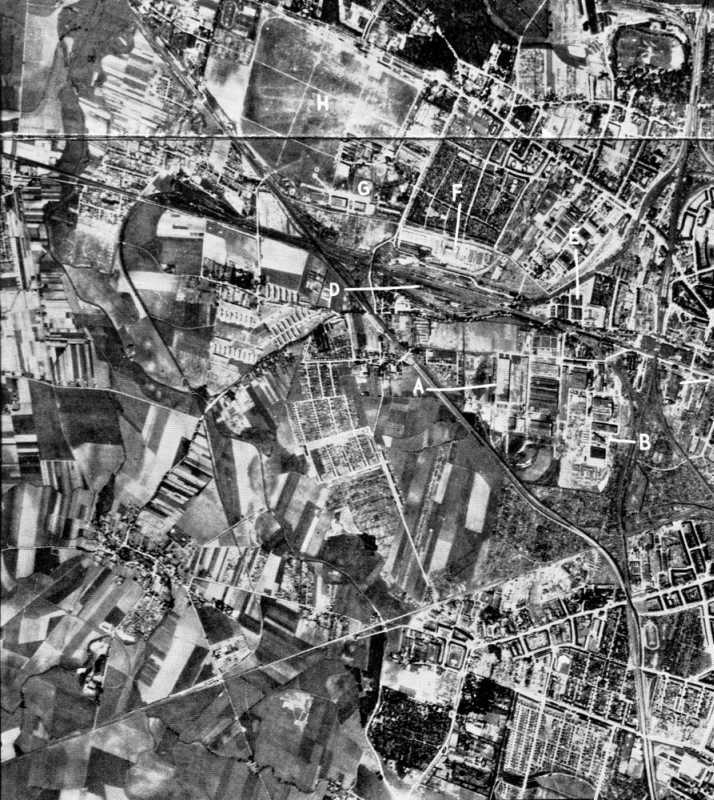 The airfield on a German map in 1938 (Multimania.de). Things began to change when Hitler announced Breslau to be a fortress in 1944. In February 1945 the Soviet Red Army encircled the city. By order of NSDAP (national-socialist) Gauleiter (regional commander) Hanke a house to house battle ensued that lasted until 6 May 1945. During this time the city, completely surrounded by the Red Army, was resupplied by Ju-52s flying in and out of Breslau-Gandau airfield, the only remaining airfield in the area. The flights initially came by day, but after the Soviets set up Flak units near the approaches, most flights came in by night. During Easter, on 1 and 2 April 1945 Allied bombers attacked the city and its factories. Phosphor bombs set 70% of the city on fire, especially industry and historic cultural sites. During the bomber raid the airfield fell to the Soviets, so a new airstrip to be built east of the city center was ordered by Gauleiter Hanke. A corridor was blown into the city, one kilometer long and 300 meters wide, requiring the work of thousands of forced labourers and civilians under hostile fire, by day and by night. The provisional runway was only used by one aircraft, and had costed 13.000 people their lives. That one aircraft was a Fieseler Storch and it carried Gauleiter Hanke out of the city. The translated story of a 10 year old boy in Breslau during those final 4 months can be read at zeitzeugenforum.de (translated with Google). Breslau capitulated on 6 May 1945, 3 days after Berlin. After the war was over, much of its German population was driven away to Germany. Polish people, themselves refugees from pre-war eastern Poland took their place. The destruction of war prevented the use of the airport. The area had to be cleared of mines and craters had to be filled, which lasted until 1947. 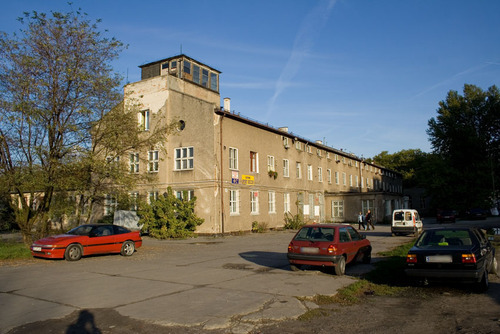 In a former hangar a plant was set up to produce Bielsk glider gliders (producing 1000 units until 1979). Between 1946 and 1958 the airport was served by LOT. Also from 1946 the airfield until its closure in 1978 was used by the Aero Club of Lower Silesia. In the mid 1970s the decision was made to build a new neighbourhood on the site of the former airfield. The street names all refer to the aviation history of the area. The old station building still exists, as do some hangars. 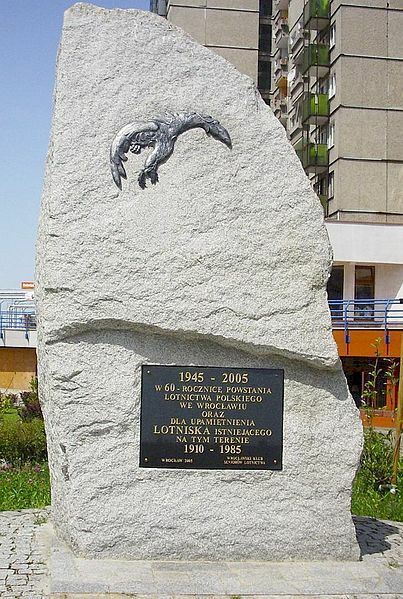 A memorial dedicated to the old airfield was erected in the new neighbourhood in 2005, but strangely refers to 1985 as the final year of operations. Former airport's terminal in 2007 (Panoramio).